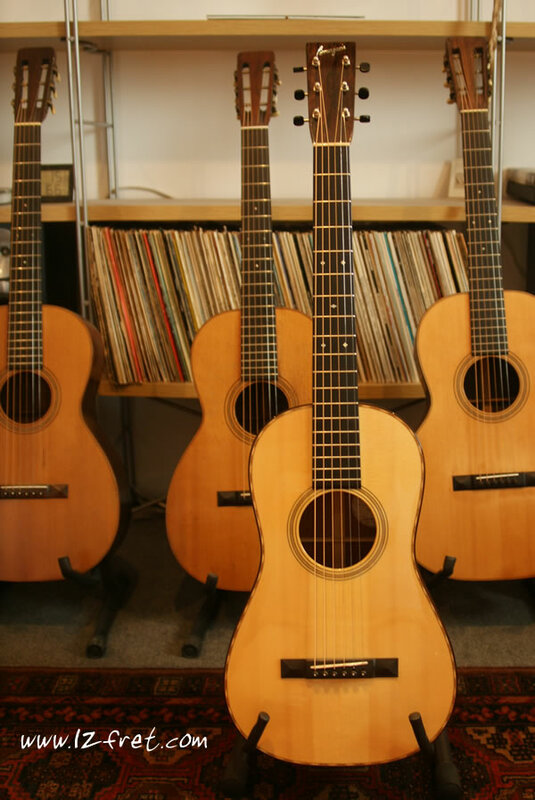 In musical instrument design, proportions can be extremely important and the Larrivee L-09 Steel String Acoustic Guitar draws from something Jean Larrivee knows very well – the Hauser-style classical guitar. Smaller than a dreadnought but larger than an OM body size and with fairly deep sides, the L-09 delivers a full, well balanced tone with lots of volume. Dating to 1978 and built at the Jean Larrivee’s shop in Victoria, BC following his move from Toronto, Ontario, this Larrivee L-09 Steel String Acoustic Guitar is in overall good condition with moderate play wear. This version uses a Sitka Spruce top with Indian Rosewood back, sides and headplate, mahogany neck and ebony for the bridge and grained-ivoroid bound fingerboard. Tuners are Grover Imperial models, and the nut and saddle are bone. The scale length is 25.5 inches 04 647.7mm and the nut width is 1.73 inches or 44mm. This guitar has had a neck reset done by Tony Duggan-Smith, who worked for Larrivee for many years and, incidentally, designed the open-ended silver border used on modern Larrivee headstocks. A very clean refret has also been done and the frets have very light wear. A non-original hardshell case is included.